1. Preheat the oven to 200˚C, gas mark 6. Mix the hoisin sauce and five spice in a small bowl. Put the meat in a small roasting tin and cover with the sauce. Roast for 30 minutes, basting halfway, until the meat is cooked through and the sauce is sticky; set aside to rest for 5 minutes. 2. Meanwhile, pour the rice into a saucepan with 250ml water. Bring to the boil, then turn to the lowest setting, cover, and simmer for 20 minutes. Take off the heat, stand for 5 minutes, then fluff with a fork. 3. Heat 1 tbsp oil in a large wok; stir-fry the onion and ginger over a medium-high heat for 2-3 minutes. Turn the heat to high, push the onion to one side and add the remaining 1 tbsp oil and the eggs. Leave for 30 seconds,then scramble with a spoon. Tip in the rice and pak choi; stir-fry until piping hot, then add the oyster and soy sauces and stir-fry for 1 minute more. 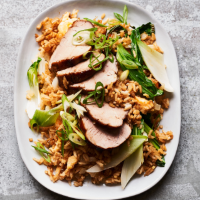 Slice the pork; serve on top of the rice, drizzled with any extra sauce and with the salad onions scattered over the top. This recipe was first published in Thu Feb 01 14:46:25 GMT 2018.